As a self-publisher for 5 years now, with fourteen novels, two short story collections and a non-fiction book of my Japan ruin adventures, you can bet I’ve commissioned a lot of book covers, and thus have a lot of experience (even wisdom?) I can pass along. Added all together that’s 17 covers commissioned, right? Well, not exactly. I think I’ve taken just about every route to a cover that is possible, including making one of them from scratch myself. So then that’s 16 covers commissioned? No again, because my three cyberpunk I’ve had re-made FOUR times (count ’em, for five versions total), my first four zombie novels I had re-made once, my epic fantasy I had re-made once, my two short story books I had re-made once, and my non-fiction I re-made myself at least FOUR times. 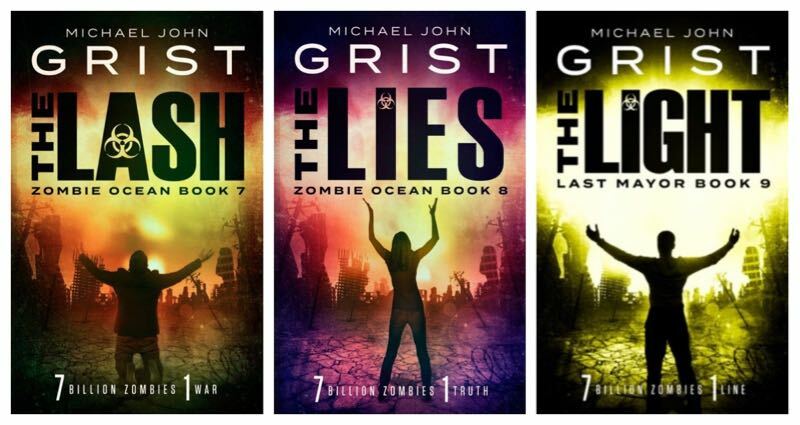 And here’s the first 4 books in my zombie series – again it’s the same books, but two sets of covers. Guess which version did the best? Coming from a background in photography, with a working knowledge of Photoshop and an eye for composition, I recommend heavily against it. Why? Because it is bloody hard to produce something that looks pro yourself, unless you do this for a living. Fonts alone are a nightmare. Making a font look good is damn hard. It can involve multiple layers, effects, textures that it could take you days to learn. And still, you wouldn’t get it right. Look at the Mr. Ruin covers above – the first three rows were my fonts. They’re not great, and that is with some idea of what I was doing. The bottom row are done by a pro and are much better. I tried once to make a similar fire effect font to those pro fonts, following a walkthrough guide on the Internet. It took me many hours, and it looked crap in the end. Yet you need these good-looking fonts. Slap on a plain white Times New Roman title and you are asking to be overlooked. It’s just a fact. That said, a bit of tinkering never hurt anyone. 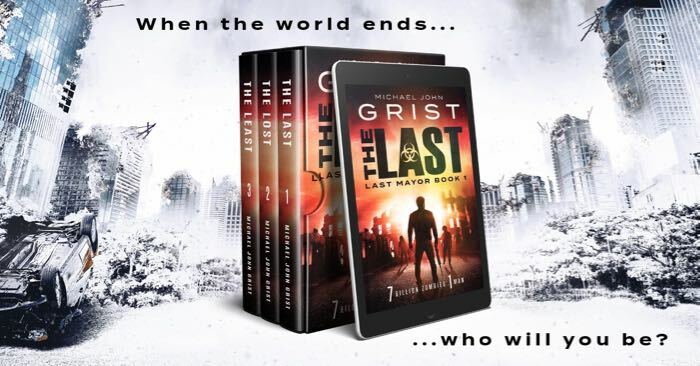 It is highly advisable, if you have Photoshop and some rudimentary skills, to get the .psd (photoshop file) off your cover artist as part of the deal, with text on separate layers. You will then be able to tinker to your heart’s content. Shift text around. Change the subtitle – as I did once for my zombie series. Make tiny alterations using clone stamp. With a bit more skill, you can turn your book cover into banner ads yourself, or BookBub ads, or whatever. Isolate elements you like. At the same time, though, you can also get these things done very nicely for $5 on Fiverr, so conisder that. Either way – get the .psd . Deviant Art is a site where artists showcase their portfolios. 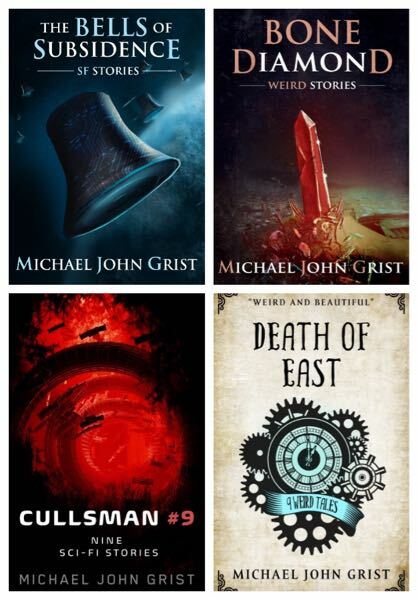 Some of my earliest book covers, along with some of my more recent ones (yet to be released) were commissioned through the Deviant Art system. They have a forum (here) where you can post jobs and artists can put themselves forward with bids and their individual portfolios. I’ve done Deviant Art commissions numerous times, and worked with lots of different artists for very reasonable prices, and I’ve never once been screwed over. There is definitely the possibility of getting screwed there. There are no ebay-like protections. It’s the Wild West of Internet transactions, but if you put in place a few commonsense precautions, equitable to everyone, then you’ll be fine. And it’s worth it. There are truly fantastic artists there who are ridicuously cheap. A full illustration/digital painting toy our exact spec, $50? $100 if you feel like splashing out? No problem at all. Thats possible because many of these artists are international, and live in countries where dollars and pounds go a lot further than they do here. $100 is a sweet rate for a days worth of work. Put up your gig. In the headline say youre looking for a book cover with typography. Give the $ amount you’re willing to pay. In the post give some details. A sense of what you’re looking for. Sit back and watch the applications roll in. Probably you’ll get 10-20. If you’re offering more $, you’ll get more. Sift through the many options. Some will be awesome. Some will be junk. Brace yourself – very few will have actual book covers in their portfolios. This is a drawback. Many of these folks don’t know how to do fonts. As I said above, fonts are a different skill. Most of the Deviant Artists do art. So you may end up either doing the fonts yourself (ugh) or hiring someone else just for that smart. Contact the artist you like. Discuss timescale and number of revisions they’re willing to do. Get it in email format, off the site ideally. Once basic terms are agreed, set up a system like this: you’ll pay half the money on initial drawings. This is fair – hopefully initial drawings won’t take them too long. It won’t be useful to you until they put more work in, so you’re not getting something for nothing. And if their initial drawings are bad, you can both part ways without too much time or money wasted. If you like it however, then pay half through Paypal. Ride them until they produce the rest. Pay up on competion, and they’ll release full files with .psd to you. Ta Dah. I’ve done this countless times, and never been screwed. Often these artists will go above and beyond, because they care about their art. Those bidding for $100 commissions are almost certainly not professional – they’re just talented beginners looking to make their name. Every work they do for is also a work for them – another piece to put in their portfolio. So they are incentivised. They can rarely do fonts. If you want a photo-manipulation cover, this is likely not the place. More and more covers are photo-manipulation, and that’s not a Deviant Art strength. They do custom illustrations, digital painting. Many of them are good enough to make an image that looks near photo real. But yes. Study portfolios carefully! I don’t use them now, but I still think they are great work. I did the fonts myself. I opted later on for photo-manipulation covers, bought through a different service that included typography. There are a profusion of book cover design services these days, and many of them are really fantastic. Some are not. It can be hard to tell, honestly, if a book cover design is good or not. The trouble with authors commissioning their own covers probably rests largely with the author. Well, we often don’t know what we’re talking about. That’s not meant as a slight. It was a big part of why, for many years, I was set on trying to get a traditional publisher for my early books. Alongside the standard reasons for this, such as trad pubs used to be the only feasible way to reach a mass market, and me wanting gatekeeper approval, was my confidence that I didn’t know jack about book marketing. Taglines. Covers. Even titles. I didn’t know how to sell my Mr. 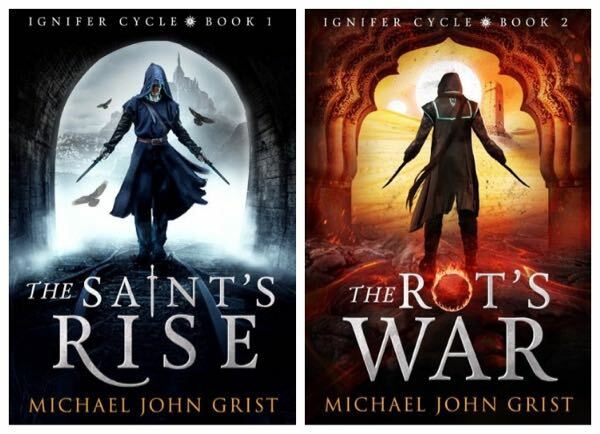 Ruin series, or my Ignifer Cycle. I wanted someone else to do it, and this reality was borne out in the not great covers I had made early on. I can’t blame it on my artist at all. They executed my vision faithfully. The problem was my vision. Going back to these. I asked for these. I thought they were a great idea that really reflected the content of the books. Book 1 is a brain on a planet’s core, with lines through it like a maze. It’s set out like a schematic. In some ways it’s similar to Labyrinth by Kate Mosse. It’s also similar to China Mieville’s covers (more on this). I loved them. It took me years to realize they didn’t appeal to my readers. They didn’t signal genre at all. These books are cyberpunk. They should have Bladerunner-ish covers, full of neon and cool purple/blues. I commissioned these from a friend. He counseled me against this design, but I pushed through. They were fairly cheap. The big pro book cover makers cost way more. The one I had my eye on, years later, was Damonza. $500 a cover! That sounded crazy. It was more than I’d made on any of my books to that date. The big pro designers definitely know about fonts. They tend much more toward photo-manipulation, which is like making a digital collage from other photographs, usually sourced off a photo repository like Shutterstock. They’re much better. 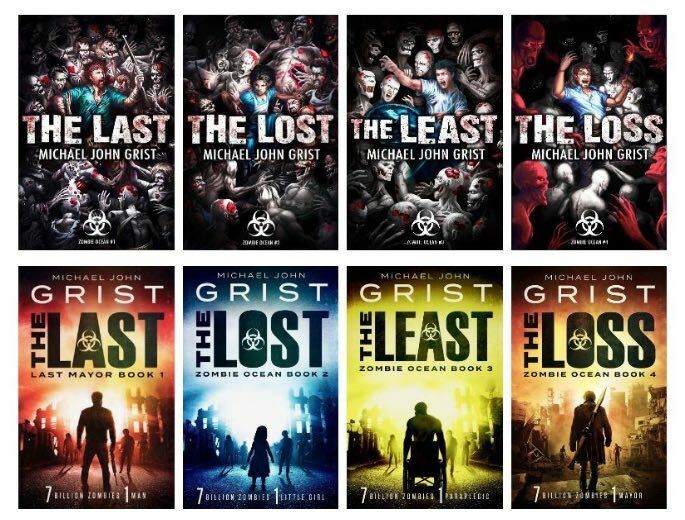 Maybe still not perfect, as these books look more like thriller covers than zombie covers. That’s what I asked for, so again, this is my own vision possibly getting in the way. It’s a learning curve, and I’ll write about educating yourself on genre and adapting your vision soon. So, $500 for the cover on the left. $250 for the next two, because the background remained the same. $500 again for number 4 with a new background, then $250 each for 5 and 6. After that I outsourced to another artist, because I had the psd. Everything had to change for book 7, apart from the layout and font, but I was tired of paying so much for quite minor changes. Here we’ve got print book, ipad and phone. The cover was made by another pro artist (more in a? minute). I framed the backdrop image. Same artist – the backdrop is something I bought off shutterstock. Anyway, the point here was getting covers done by fiverr artist on the ultra cheap. So, I tried this a few ways, starting with the Mr. Ruin covers. Most gigs on fiverr are $5 but you can pay more. I paid maybe $20, and I got exactly what I paid for. I didn’t even keep the images that artist produced, because they were so poor. These are definitely grimier than the first 6, but considering the price I was over the moon. The series is 7 books in at this point – I figure anyone who’s already read 6 books won’t quit on the 7th because the cover is not quite as clean. I saved myself about $900 doing it this way. I could have saved even more if I went with a premade. Often these are covers that a designer makes for a client, but the client rejects. Many of the big design companies will present you with several draft ideas to choose from. Damonza gives you 3 for your $500. You pick the one you want and develop it, while they keep the other 2, stick a generic title on, and make it a premade, on sale for anything from $20-$50. For a long time I had Deviant Art-created covers on my 2 short story collections. You can see them here, and judge them as you will. Bone Diamond does not look great… I didn’t want to invest much in getting new covers for these, as they have never sold much, but I did want to smarten up my portfolio, so I picked 2 covers from Go On write. I liked that the old ones matched in setup and typography, but they just didn’t look pro. The new ones look better. I changed the titles to freshen them up as well. 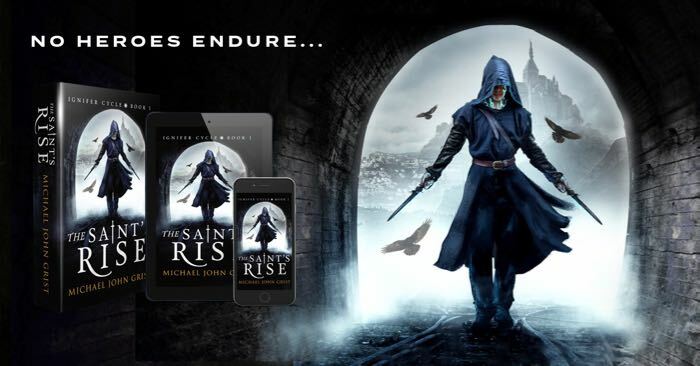 I mentioned above that I had my Saint’s Rise books made by a pro individual artist. This was Clarissa Yeo – I found her when I saw a cover I really liked online, read up on the artist, and contacted her. There was something like a 4-month wait. This is a major difference between a solo artist like Clarissa and a service like Damonza or 99-Designs. The big services have a stable of artists who will make your cover in a week or so. Soloists have a wait list – but are often cheaper by comparison, and can produce fantastic quality. 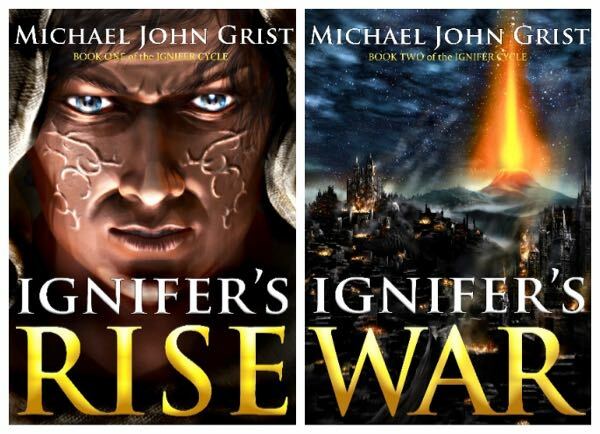 Here’s the covers I had made for my two Ignifer Cycle book some 8/9 years ago – from the same artist who did the first Mr. Ruins (a friend). This is another case where he made the cover and I did the fonts. I still think these are realy striking images, but- they don’t match what’s out there in the genre. Maybe they don’t signal genre at all. In total book 1 sold maybe 200 copies. Book 2 probably sold 50. I love these. Interestingly, the tunnel walls and underfoot rails in book 1 come from photos I took myself in my ruins exploring days. Pretty neat. Largely on the strength of these covers, these books have sold thousands of copies. Clarissa charges $299 now for an ebook cover. Definitely worth it, if you can book her. There are countless other individual cover artists out there, running their own businesses through their own websites. Natasha Snow made the last row of my Mr. 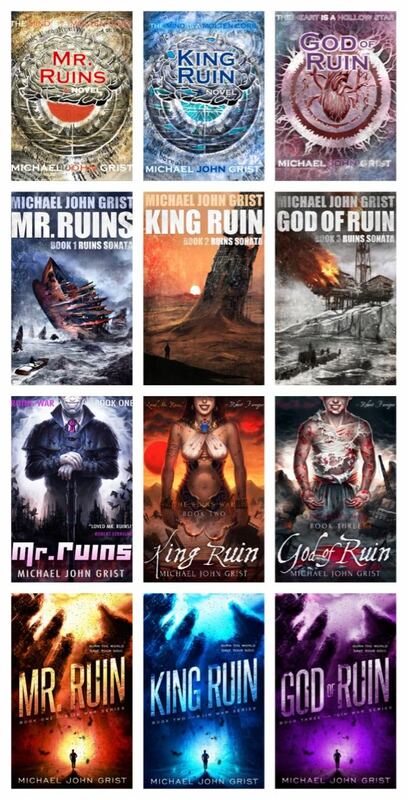 Ruin covers. You only need to look at great comparable book covers, find out who the artist was, and reach out. Pretty neat, right? They don’t signal genre at all, and the only one I ever released was Killin Jack, but it maybe sold only 2 copies. This was in 2013, when I had no clue about marketing at all. In summary, my advice is – pay for a pro cover from a service like Damonza or from a pro solo designer like Clarissa Yeo. You’ll have to drop some cash, but it’s worth it. They know what they’re doing. Ah. But here’s the rub. Do you know what you’re doing? Do you know what you’re asking for? Look at all the ways I asked for the wrong thing over my commissioning career. I’ve spent thousands of dollars on covers I just had to get re-made. An artist can only really realize your vision, and if your vision is badly skewed? The cover will be bad even if it’s pretty. It needs to work for your genre. I’ll write a post about how to make your cover signal genre and appeal to genre fans next. You can also take a look at my Adventures in Book Marketing posts to see more examples!